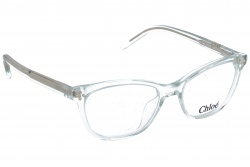 Glasses by Chloé stand out for its designs, they do not leave anyone indifferent. 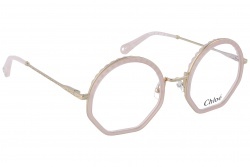 They are intended for those people who like to risk without leaving aside the elegance that these glasses provide. These sunglasses stand out for its big size. Furthermore, the brand does not hesitate in using risky lines that stand above their frames. They add volume and personality equally. The majority of models are metallic but they also offer a wide variety of acetate frames. Their lenses are degraded in soft tones. There are models in which we can find a combination of two colours in the same lens, adding modern and charismatic touches to the product. All of them have 100% UV protection. Among them we can find both organic and mineral lenses. Inside the Chloé catalogue we can find prescription glasses. They stand out for its risky shapes. All of them present geometric shapes in which designers play with sizes and forms. Hexagons, circles, squares… Each shape is intended for different faces so they are adaptable to each face. In terms of colour it is important to emphasize the use of vivid colours as green or pink. Chloé was created in 1952 by Gaby Aghion. From that moment onwards, the brand becomes a relevant fashion company in which sophistication and innovation go together. Nowadays many actresses, models and singers choose Chloé as one of their favourites. It is not strange to see Kim Kardashian, Rihanna or Eva Mendes wearing glasses from this brand. In Optical H you can find the best models at best price. In our large catalogue you will find the design that you are looking for. Buy in our webpage is quick and easy. Furthermore, you can check all your doubts to our professional team who will assess you during the purchase process.